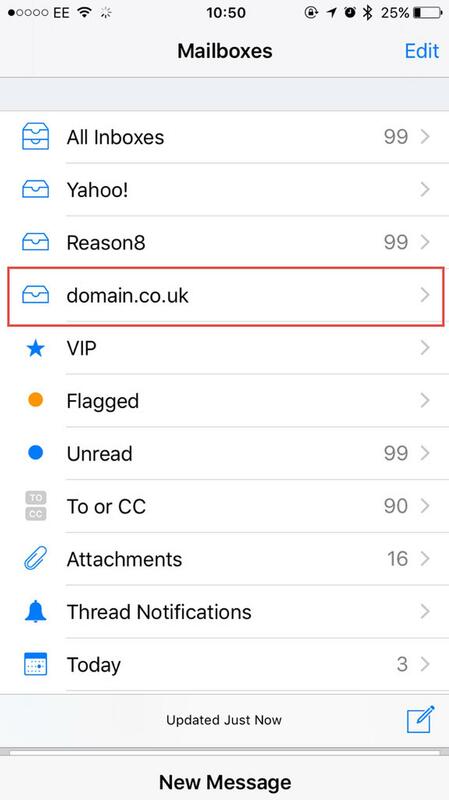 How do I setup my iPhone or iPad to receive emails ? 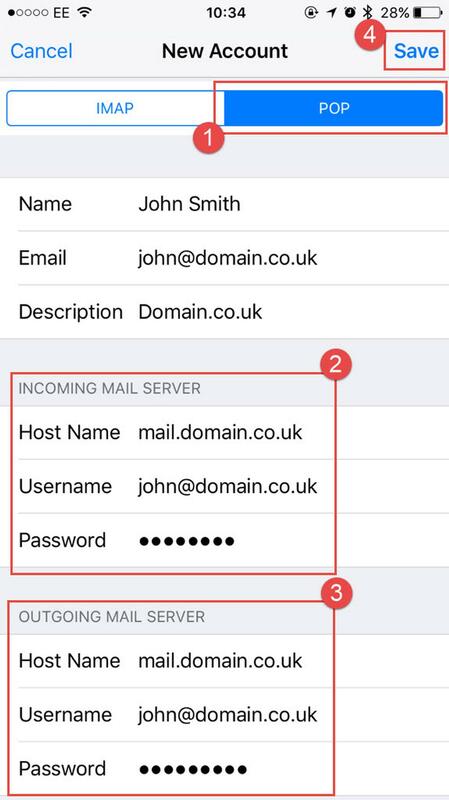 Learn how to setup your iPhone or iPad to send and receive emails using your own personal email mailbox. We show you how to setup the receiving and sending of emails and deal with all the security implications. Being able to send and receive emails from your phone is phone or tablet is now no longer a 'nice option' but a basic requirement. We are all a lot more mobile and you need to stay in contact with your business wherever you are. This article shows you in simple steps how to setup your email POP3 mailbox on your Apple iphone or Apple iPad. 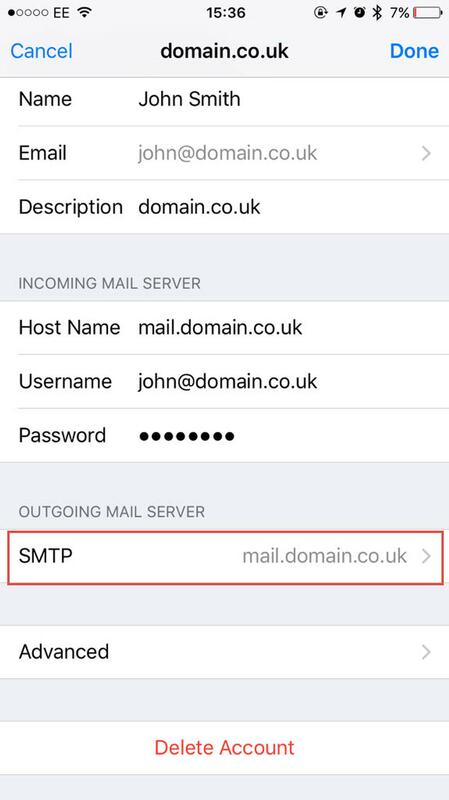 We take you through the settings for your inbound mailserver, your outbound mailserver (sometimes known as SMTP server) and all the port and SSL options. 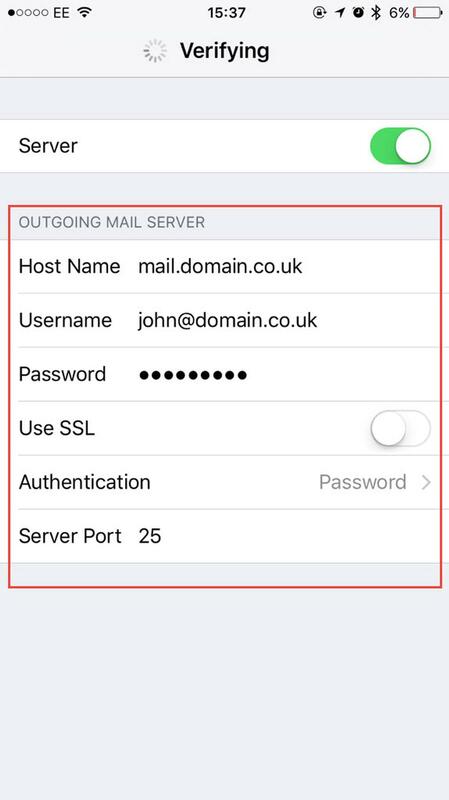 Before trying to setting up your mail on your Apple device, please make sure you have upgraded your account with the Pro Mail service. If you have already created a mail account for our service you MUST DELETE THIS FIRST. Please don't try and modify the existing account. We have found that the best way to ensure that the account is setup is to start from fresh. 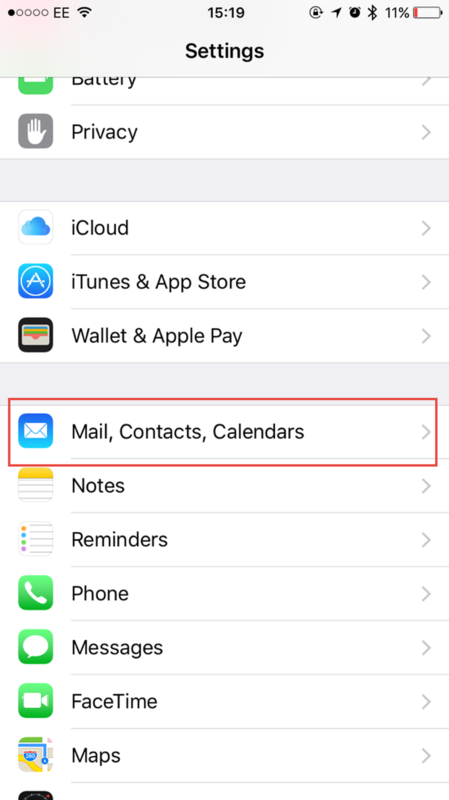 Click settings and scroll down to MAIL, CONTACTS, CALENDARS. Tap this option. 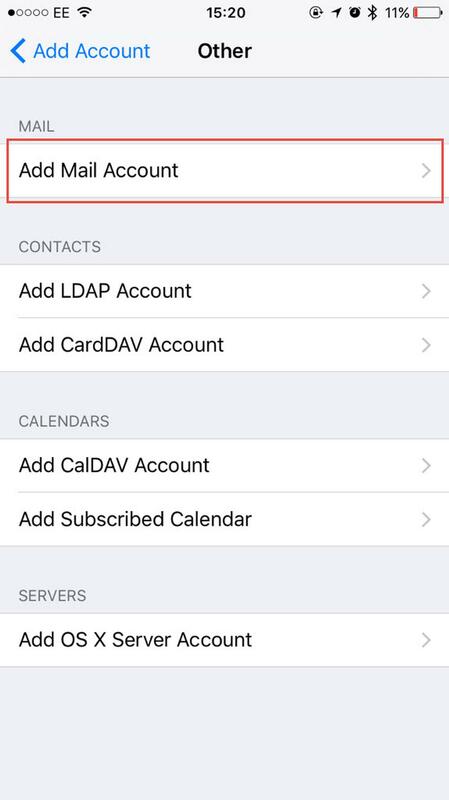 Since you want to create your own custom mailbox, tap the setting 'OTHER' which will allow us to add our own settings. 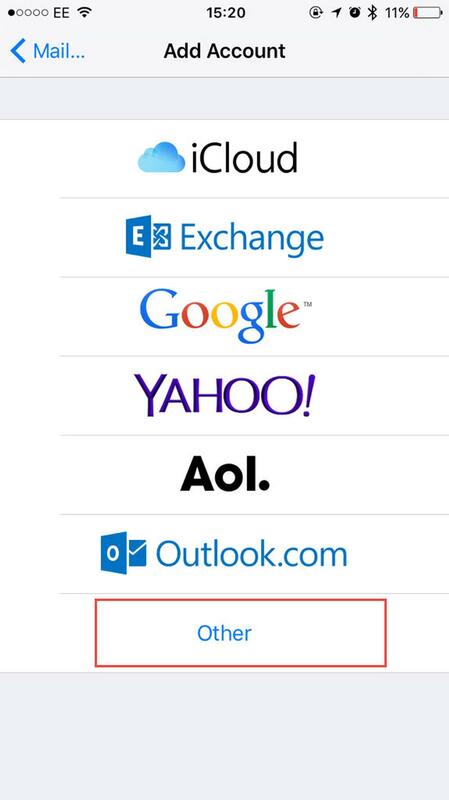 You mail username is YOUR FULL EMAIL ADDRESS (not the mail prefix). Your Password will have been sent to you, or you can change it yourself in your control panel. Complete the short form adding your basic details. Ten tap the NEXT button top right. Add all the mail server details . All Apple devices (including iPhone and iPad) will activate a security setting (called SSL by default). This is not required by your mail server (we have our own internal security instead). 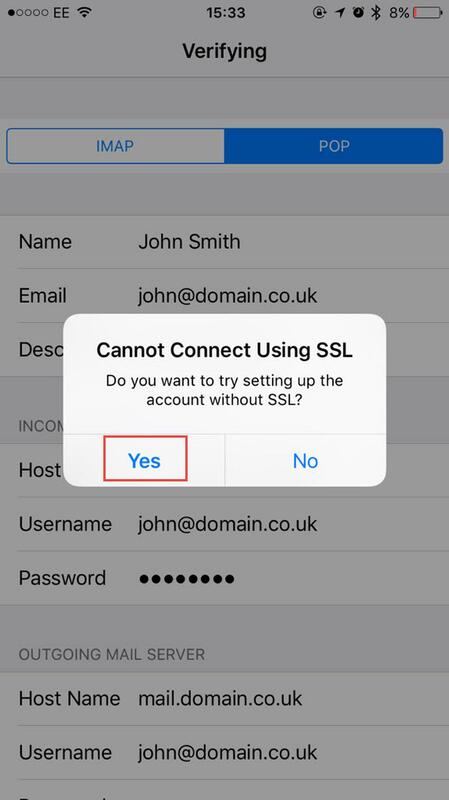 When you submit Step 5 above, your Apple device may try and connect with the SSL security and your server will reject the attempt. Depending on your ios version you may get a warning as shown in this image. If you get this warning click YES and this SSL option will be removed. That's it - time to test your new mail. What if you still can't connect ? 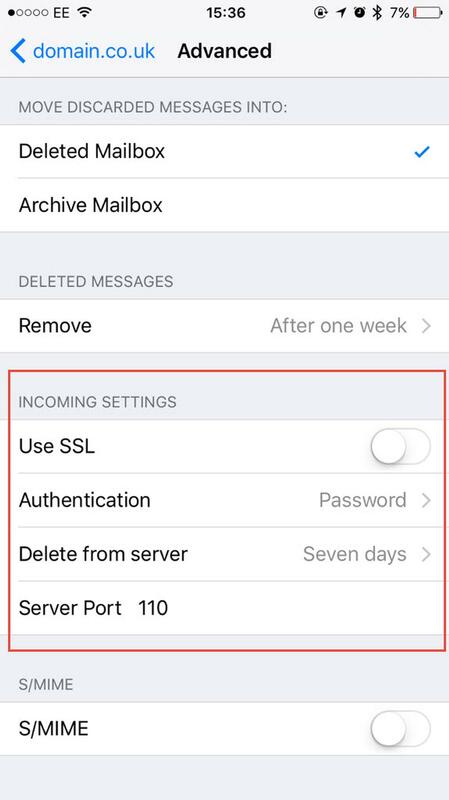 If you find that you still cant connect then follow these extra steps that show you how to check the server details thta should have been added automatically by your Apple device. 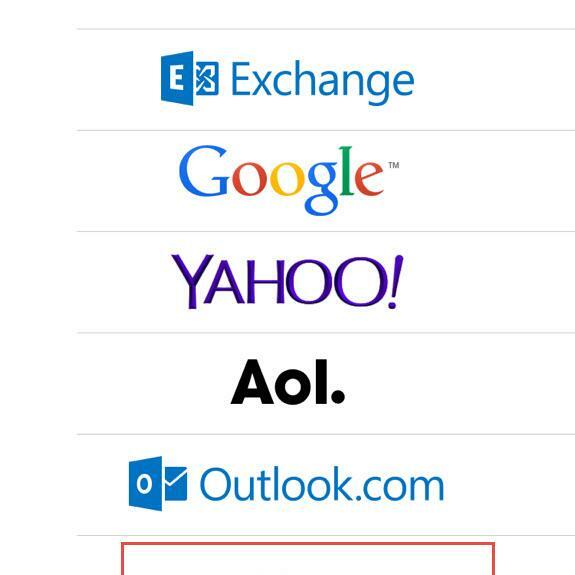 Go back to settings and then choose MAIL, CONTACTS, CALENDARS. Just like you did in Step 1 above and choose the new account that you just created. 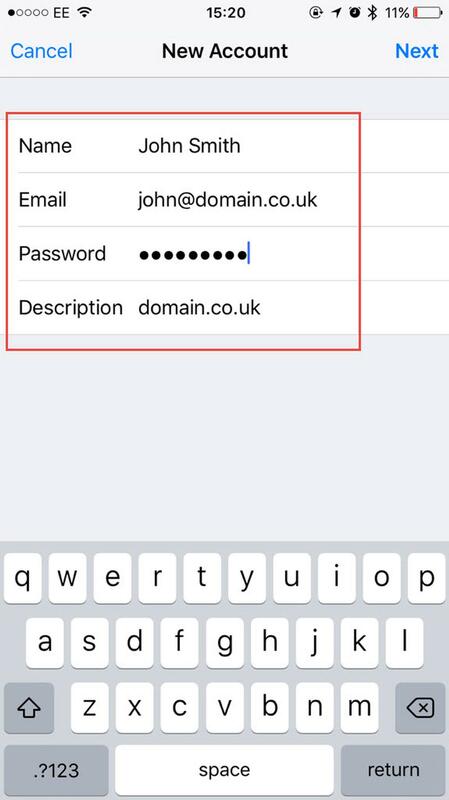 The first thing to check (and the most common source of problems) is that you entered your username (full email address) and password correctly. Also remember where we have added a dummy domain.co.uk - you must add your own domain instead of this dummy domain name. After clicking on your account you should see this screen. Scroll to the bottom and tap the ADVANCED option. Make sure your settings are the same as these shown. In particular make sure that SSL is disabled and you are using port 110. Click on the SMTP option. This will display a screen of options that you can check. Make sure the outbound server details are as shown in this example. In particular make sure the server port is set to 25 and SSL is disabled.